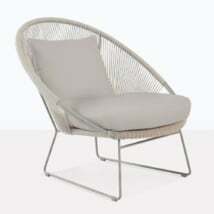 The Natalie Outdoor Lounge Chair is a brilliant example of how a chair can be something more than just seating. Three different materials combine to make a luxury outdoor lounge chair that is both incredibly comfortable and a functional piece of art. Low and luxurious, the Natalie Outdoor Lounge Chair in Black is part of our new, beautiful range of Ecolene® All Weather Wicker Furniture. The Natalie Outdoor Lounge Chair in Black is mid-century in style; featuring a low, round frame that joins to the base and back pieces with strips of glorious, strong tubing of Ecolene® All Wicker. 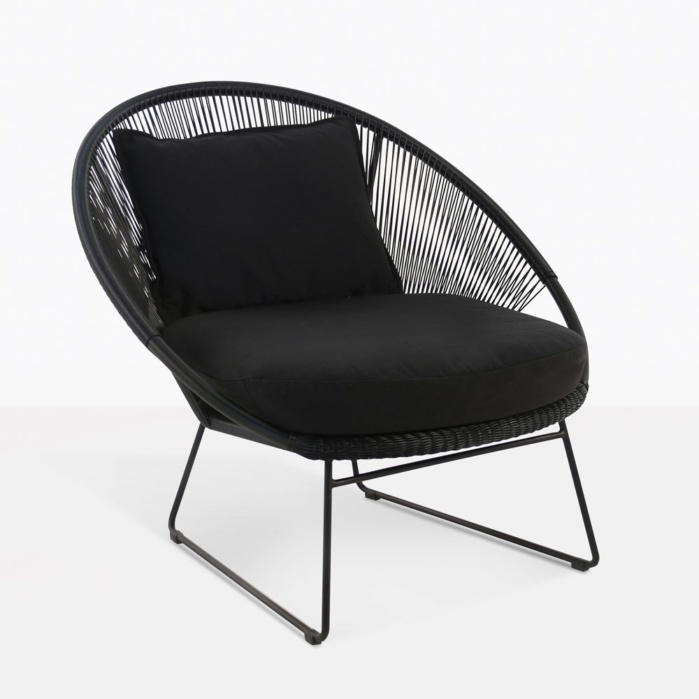 The Natalie Outdoor Lounge Chair in Black is 34 by 36 inches and 32 inches high making it the perfect size for the modest patio, or as an addition to the poolside for relaxing after a swim. 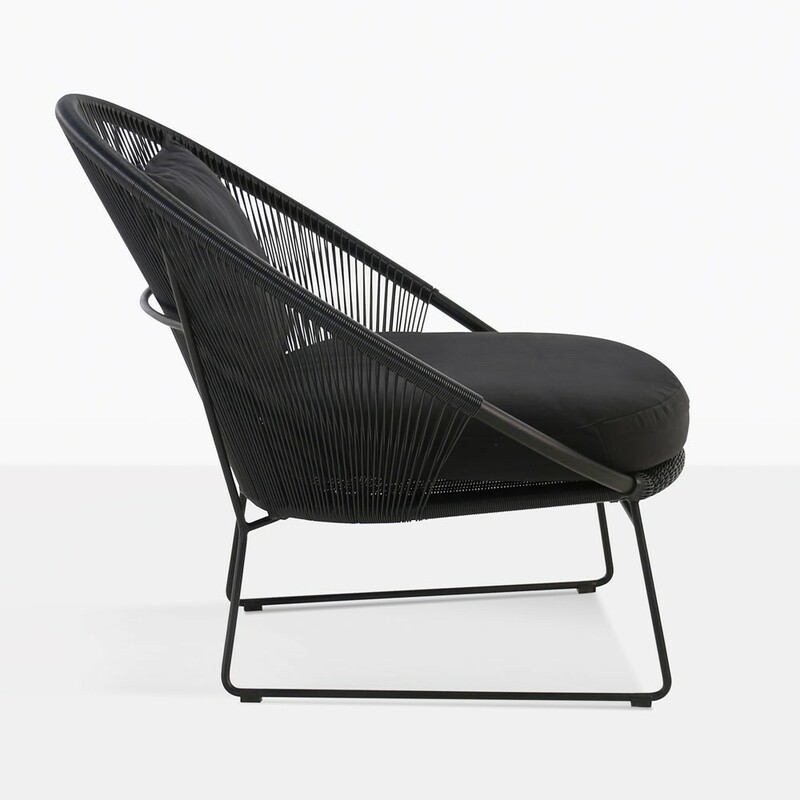 W34" x D36" x H32"
The Natalie Outdoor Lounge Chair in Black is made of a powder coated aluminium frame and Ecolene® Wicker which is our new polyethylene synthetic material, through dyed and UV treated. Its beautiful feel is attributed to the unique eco-friendly material, which is resistant to different heats, and damage in the great outdoors. 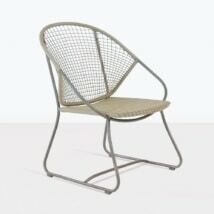 This exciting new product is a marvelous addition to the fantastic range of outdoor furniture at Teak Warehouse. 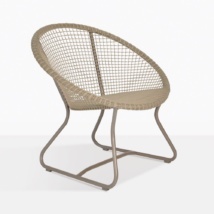 As well as Ecolene®, we also carry award-winning Viro® wicker. Our range of materials span from A-Grade to Reclaimed Teak, Raw Concrete composites, #316 Stainless Steel, Batyline® mesh and Sunbrella® fabrics. At Teak Warehouse, we are happy to supply your home or business with everything from sun loungers to deep seating, umbrellas and planters, dining tables and chairs – all for the outdoors. And we supply the entire United States of America! We can provide shipping quotes for a white glove delivery service that will deliver our furniture to your home with no extra charge. We have been in business for over 20 years now, because of our commitment to bringing our customers long lasting, quality and beautiful furniture. 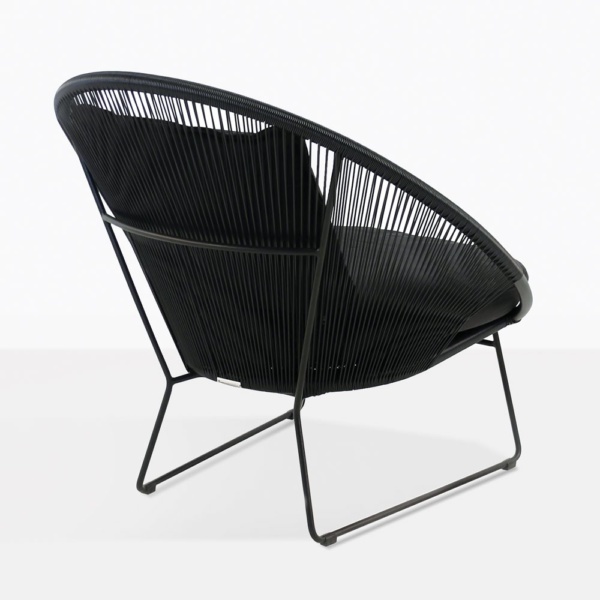 The Natalie Outdoor Lounge Chair is a brilliant example of how a chair can be something more than just seating. Three different materials combine to make a luxury outdoor lounge chair that is both incredibly comfortable and a functional piece of art. Try four of the Natalie Outdoor Lounge Chair in Black around one of our terrific low round reclaimed teak coffee tables, for a sumptuous modern setting ideal for casual dinners and drinks on hot summer nights. 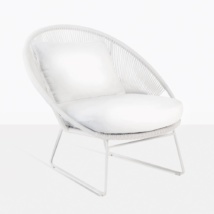 The Natalie Outdoor Lounge Chair in Black is also available in white, taupe and blue colors. Mix and match or find a hue that’s right for you! Create a fun setting around your pool, with one of each chair with a Raw Concrete Accent Table in between each one for a contemporary modern flavor. Our Natalie Outdoor Lounge Chair in Black can also be placed in a conservatory or sunroom for that space to take in the beauty of nature while being sheltered from the elements. Just add an appropriate side table to suit the space, and you will be enjoying comfort and style very soon. At Teak Warehouse, we are happy to help you find the best combination to suit your space and style. The Natalie Outdoor Lounge Chair in Black is the beginning of something extraordinary. Purchase yours today.